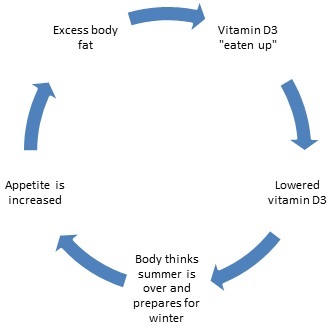 Obesity and Vitamin D ~ The Reluctant P.O.W. Did you know that a person who is obese (BMI of 30 or greater) requires 2 to 5 times the amount of Vitamin D? That's 1,200 to 3,000 IU's a day. Body fat interferes with vitamin D absorption. The government recommends 200 to 600 IU of vitamin a day. This is the amount you need to prevent rickets, a disease caused by vitamin D deficiency. But the real question is: How much vitamin D do we need for OPTIMAL health? This website recommends a daily oral dose of 4,000 IU's daily.